The specifics of MongoDB and now DocumentDB are not particularly important to this article; basically, MongoDB created a type of database that is more flexible and better suited to large1 amounts of both structured and unstructured data, making it useful for large scale applications that traditional relational databases were never designed to accommodate. And now you can run it on AWS. Kind of. AGPL is a close relative of the GPL, the copyleft license created by Richard Stallman. “Copyleft” means that the license allows for the free distribution, use, and modification of copyrighted material (in this case software), with the stipulation that those same rights extend to all derivative works; that means that any project built using GPL code must itself have a GPL license. This is in contrast to “permissive” open source licenses that allow others to use the copyrighted material however they wish, without a stipulation that derivative works also be open-sourced. AGPL extended the GPL to apply to software accessed over a network; since the software is only being used, not copied, the GPL would not triggered, but the end result is even more onerous than the GPL. The license places restrictions on software used over a network which are extremely difficult for Google to comply with. Using AGPL software requires that anything it links to must also be licensed under the AGPL. Even if you think you aren’t linking to anything important, it still presents a huge risk to Google because of how integrated much of our code is. The risks heavily outweigh the benefits. In some cases, we may have alternative licenses available for AGPL licensed code. Unlike software companies built around third-party open source projects, we own the intellectual property of our offerings since we are the creators of the software, enabling our proprietary software subscription business model…Our primary subscription package is MongoDB Enterprise Advanced, our comprehensive offering for enterprise customers that can be run in the cloud, on-premise or in a hybrid environment. MongoDB Enterprise Advanced includes our proprietary database server, advanced security, enterprise management capabilities, our graphical user interface, analytics integrations, technical support and a commercial license to our platform. We also offer MongoDB Atlas, our cloud hosted database-as-a-service, or DBaaS, offering that includes comprehensive infrastructure and management of our Community Server offering. The largest company selling software-as-a-service is, of course, Amazon. That, though, does not mean that Amazon is selling “software.” The reality is that software is no different than music: it is infinitely reproducible, and thus, in isolation, worth nothing. First is hardware. The most famous example is the iPhone, which is the only way to obtain iOS, but there are countless other examples. Second is licenses. This was Microsoft’s core business for decades: licenses sold to OEMs (for the consumer market) or to companies directly (for the enterprise market). Indeed, there is a bit of irony in that both Microsoft and open source, for all their historical opposition to each other, both depended on copyright, strong legal regimes, and companies doing the right thing. Third is software-as-a-service. This is Microsoft’s new model, as well as Amazon’s, and almost all new enterprise software companies.5 In this case what is being sold is not the software per se, but rather the utility of the software: the company doing the selling does everything else, including making the software available reliably. The storage layer is distributed, fault-tolerant, and self-healing, giving you the the performance, scalability, and availability needed to run production-scale MongoDB workloads. Make no mistake: these benefits are valuable. There is a secular shift in enterprise computing moving to the cloud, not because it is necessarily cheaper (although costs are more closely aligned to usage), but because performance, scalability, and availability are hard problems that have little to do with the core competency and point of differentiation of most companies. Those are, though, the core competency of AWS, which can bring unmatched scale to bear on solving them: by effectively operating the servers for millions of customers Amazon can apply more resources to all of those issues than any one company could on its own, as well as develop its own customer architecture, from datacenter software down to custom chips (and drive a hard bargain for hardware from suppliers like Intel). The result is that “performance, scalability, and availability” is a tremendously attractive business: the more customers AWS has not only drive that much more recurring revenue, but also deepen AWS’ moat by allowing the company to bring that many more resources to bear on ever more obscure use cases, making AWS that much more attractive to new customers. Microsoft is competing but is a distant second; Google is even further behind. In fact, even MongoDB’s managed service runs on the three giants: it simply makes no sense to go it alone. More and more enterprises don’t want to run their own software: they want to hire AWS (or Microsoft6 or Google) to run it for them, because they value performance, scalability, and availability. Worse, because AWS doesn’t have access to MongoDB (it is only matching the API) it only supports MongoDB 3.6; the current version is 4.0.5. It is possible that if AWS’ service becomes popular MongoDB will effectively stagnate: sure, you can get a better version from MongoDB Inc., but then you have to manage it yourself or go the effort to tie in all of your AWS services with MongoDB’s offering (then again, the potential for differentiation may be MongoDB’s salvation, and an important lesson for other companies). Not that permissive licensing would necessarily help: Redis Labs offers its Redis database under a permissive license; that means that AWS’ offering is usually up-to-date, which is good for Redis development, but doesn’t help Redis Labs make any money. That compelled Redis Labs to change the licensing on its add-on modules to add the “Commons Clause”; this compels service providers to pay for their use, effectively making them proprietary software. It’s hard to not be sympathetic to MongoDB Inc. and Redis Labs: both spent a lot of money and effort building their products, and now Amazon is making money off of them. But that’s the thing: Amazon isn’t making money by selling software, they are making money by providing a service that enterprises value, and both MongoDB and Redis are popular in large part because they were open source to begin with. Little of what I wrote is new to folks in the open source community: the debate over the impact of cloud services on open source has been a strident one for a while now. I think, though, that the debate gets sidetracked by (understandable) discussions about “fairness” and what AWS supposedly owes open source. Yes, companies like MongoDB Inc. and Redis Labs worked hard, and yes, AWS is largely built on open source, but the world is governed by economic realities, not subjective judgments of fairness. 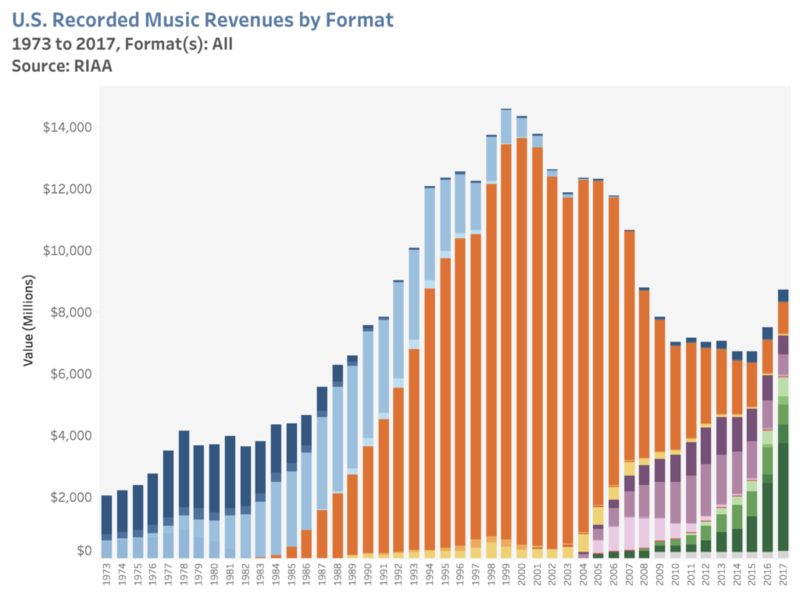 And that is why I started with music: it wasn’t necessarily “fair” that music industry sales plummeted, and yes, companies like Apple with its iPod business made billions off of piracy. The only reality that mattered, though, was that music itself, thanks to its infinite reproducibility, was as pure a commodity as there could be. A copy of a program has nearly zero marginal cost (and you can pay this cost by doing the work yourself), so in a free market, it would have nearly zero price. A license fee is a significant disincentive to use the program. If a widely useful program is proprietary, far fewer people will use it. That, though, should give pause to AWS, Microsoft, and Google. It is hard to imagine them ever paying for open source software, but at the same time, writing (public-facing) software isn’t necessarily the core competency of their cloud businesses. They too have benefited from open-source companies: they provide the means by which their performance, scalability, and availability are realized. Right now everyone is winning: simply following economic realities could, in the long run, mean everyone is worse off.